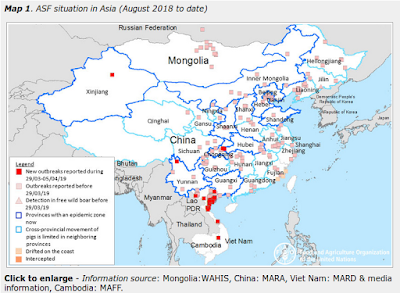 It is a source of some frustration that more than two weeks after France notified the OIE of the first occurrence of HPAI H5N2 in their country (which came only a week after notifying about a new strain of H5N1), that we still don't have anything more than a cursory characterization of these new viruses. Since then, we've seen the emergence of a new HPAI H5N9, and a new LPAI H5N3 virus as well, the details of which are equally scant. While the total number of outbreaks and detections remains relatively low (less than 40 at this writing), this represents an unprecedented number of new avian flu strains to emerge in such a short period of time. Whether these new strains are the product of LPAI to HPAI mutation - as was indicated with the first new H5N1 reported last month and was reported in both Germany and England over the summer - or reassortment - or both, remains unclear (see You Say You Want An Evolution?). All we really know is they are apparently of `European' lineage, not from the Asian H5N1. Reassuring, but leaving a lot of unanswered questions. Until the epidemiology of the current outbreaks in France is known, the index cases, level of spread and the wider impact or risk to other regions and Member States is not known at present. These are apparently all European origin LPAI and HPAI viruses, but publicly available detailed genetic data are not available yet. Until the epidemiology and genetic sequencing of the viruses associated with the current outbreaks in France is known, the index case(s) identified, the extent of virus evolution/diversity , level of spread,the wider impact or risk to other regions and Member States cannot be defined at present. The full report (dated the 16th, but published today) is available at the link below. Since the last update on the 7th December, several new outbreaks in poultry have now been reported as a result of increased surveillance in South West France (Ministère de l’Agriculture, France, 2015; see map – not all outbreaks visible at this scale). To date there are 15 outbreaks of HPAI H5 (N1, N2 and N9) and seven outbreaks of LPAI H5 (N2 and N3) which have been reported to the EU Animal Disease Notification System and in addition there may be a further 15 cases of HPAI reported on the French Surveillance platform (Hamon & Fediaevsky, 2015). As before, there are still many unknowns and a lot of uncertainty. The risk to the UK as a result of these outbreaks is primarily around pathways which involve lapses in biosecurity or trade routes, rather than through wild birds as these are apparently wholly European origin viruses. 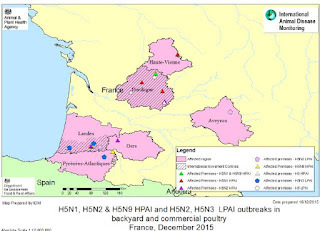 However the situation in France simply reinforces what we already knew, that these LPAI viruses circulate in wild birds and cause occasional spill-over outbreaks in poultry may be difficult to detect in domestic waterfowl species and which may then mutate into HPAI viruses following infection of galliforme hosts. Whilst there is uncertainty over the identity of the index case(s) and the pathways for virus evolution (including the genesis of three HPAI subtypes) and the host populations/networks in which these occurred introduction by other transmission pathways from other undisclosed sources cannot be excluded. However it would appear based on information available to date and knowledge of the biology of these viruses that the new cases in France may be related. Detailed genetic analyses of the causative viruses will be critical to understanding these events and defining with greater certainty risk pathways and periods for spread of infection. Whether the index case for the LPAI to HPAI mutation (s) has been found is uncertain. You'll note the repeated use of the words `uncertain' and `unknown' in the above report. Hopefully we'll get some better answers soon.